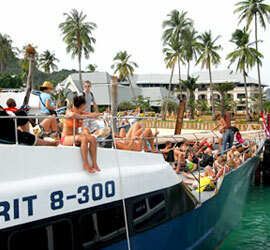 Starting from November through April boats are leaving twice daily from Chaofa Pier in Krabi Town. Departure is at 10:30 and 13:30. The boats arrive to Saladan at the northern tip of Ko Lanta about 2 hours later. Open pick-up trucks and minibuses are waiting at the pier to bring you to the resort. This transfer is offered free of charge by our resorts. For the return trip boats are leaving from Saladan at 08:00 and 13:00. From May to October the boats from Krabi to Ko Lanta do not operate due to strong winds and high waves in the monsoon season. During this time, public minibusse take over the transportation between Krabi and Ko Lanta. Sun bathing and view seeing on the ferry's Top is enjoy for all visiters.